Hello and welcome to the first of hopefully many posts about my misadventures in developing (and bug fixing) Colibri – hope you enjoy your stay! Some time ago I’ve made the decision to switch to a slower release cycle in order to have a bit more time to polish new features and enhancements before they are released in the form of an update and also to not annoy my users with constant updates as I’ve heard that most people find frequent updates inconvenient. Doing a quick search in the Mac AppStore lead me to believe that the current selection of MIDI players is scarce at best – which brings us to the main element of the upcoming update: as the BASS engine has native support for both MOD and MIDI music (via plugin) it was a no-brainer to teach our bird how to chirp glorious video game music and Nokia ringtones aka MOD/MIDI music. Having entangled myself in a series of doubts regarding the legality of bundling MIDI SoundFonts with Colibri I’ve come to the conclusion that the best way to avoid angering the reviewers at Apple (and copyright holders of said soundfonts in general) is to ship the next update with a free, publicly available soundfont as I’m sure most of you would like to try your MIDI files right away – user supplied SoundFonts are supported and are strongly encouraged! 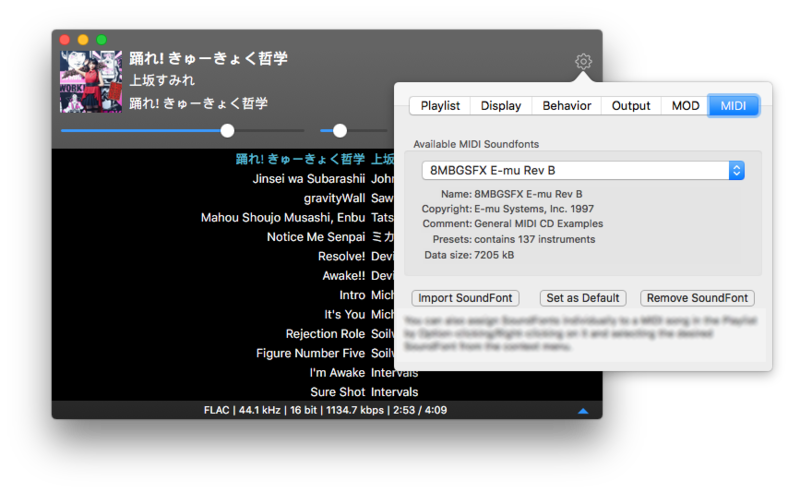 There’s also a neat new feature currently entering the finalization phase that introduces a new customization convenience option for playing back MIDI files that I personally haven’t seen before in any other player. That’s about it for now, happy listening!